At this point, we hope you’re seeing how content marketing can transform an online business into a runaway success story. particularly fertile ground for a solid content strategy. Today we’ll talk about just one example. Marcus Sheridan’s pool company was hit hard by the recession in 2008. He and his business partners discovered that in order to save their business, they had to get creative — fast. They decided to try blogging, and they started writing content for their site by simply answering their customers’ questions through their blog posts. Today, his pool company website gets more traffic than any other pool company site in the world. River Pools is thriving, and Marcus has now expanded his business to include providing social media coaching for other businesses. I heard Marcus speak at the 2013 Social Media Marketing World in San Diego, and was blown away by his hilarious speaking style. I was delighted to join the rest of the audience in giving him a standing ovation for his speech. Let’s hear a little more from Marcus about how he saved his pool company by embracing content marketing, and about what he’s up to today. What’s your site and what do you write about? My pool company, River Pools, is a fiberglass swimming pool construction company in the Virginia/Maryland area of the US. On our site, we literally answer every question a consumer could possibly have about buying a fiberglass pool. With my online marketing consulting business, The Sales Lion, I help companies solve their marketing problems in a way that’s applicable, frankly written, and personable — with an emphasis on content marketing, messaging, and powerful communication. Ultimately, it’s my goal to help individuals and businesses reach their potential, online and offline. Who are your readers and how do you serve them? Was there a pressing problem you were trying to solve? My readers are mainly small to medium-sized companies, marketers, and business owners who are looking to embrace this new world of digital marketing but aren’t quite sure where to start or how to go about it effectively. What kinds of content are most important to your business? Blog? Email list? Podcast? I see all content as intricately connected. I may write a blog post today. Tomorrow, I may take that blog post, combine it with five others, and call it an ebook. The next day I might take that ebook and send it to my email list (a list that was built by giving away another free ebook). I might also talk about the thoughts from that blog post through video or during my podcast. But again, everything is intricately connected … but to definitively answer your question, everything starts with a single blog post and grows from there. What was your situation before you started blogging? Were you always a business owner, or did you have a more traditional career? I started River Pools with two partners in 2001, and when the housing market collapsed in 2008, we were in big trouble. That’s when we discovered content marketing and decided to be the best teachers in the world about our business — which was inground fiberglass swimming pools. This decision saved our company. How do you use social networking in your business? For River Pools, we don’t use it much. We have found there is a much higher return on investment when we focus our time producing more content on the site. With The Sales Lion, social networking is much more important, because marketing is a very “social” industry. Mainly I use Twitter as a means of thanking my readers, and also gauging what content resonates with them and what does not. What were some of the main tipping points or “a-ha!” moments (if any)? How did they come about? My philosophy is that if anyone has asked me a question about my business, regardless of what it is, it’s my job to answer that question — preferably on my website. This philosophy is what made River Pools so incredibly successful, and is also what drives much of the growth of The Sales Lion. What were your biggest mistakes, or biggest wastes of time/money? For The Sales Lion, it was the fact that I waited so long to start building my email list. Subscription rates went up about 500% once I put up an opt-in form and started giving away my ebook, Inbound and Content Marketing Made Easy. After that, my ability to communicate and market to my audience improved drastically. Why do you think you became an independent business owner and blogger, when most people just stick with the career they have, even if it’s unsatisfying? What’s different about you? Looking back, I realize I started blogging with River Pools because, at my core, I’m a teacher. That’s what I do. I distill information in a way the rest of the world can understand it and run with it. This is what drives me daily to do what I do. What does your business look like today? River Pools is incredibly successful and an industry leader. The Sales Lion brand grows and grows. Today, I speak around the world about content marketing and share my story of “pool guy turned marketing guy.” I strive to find success stories similar to mine with all the clients I now engage with. Financially, as you can likely imagine, I’ve never been better. I’ve got four incredible kids. My wife can go to the grocery store and buy whatever she wants. That may sound silly, but knowing this is very, very satisfying. What’s next for you? What are your next goals? I plan on writing a New York Times bestseller. Recently, I signed with Seth Godin’s literary agent and we are in the process of finding the right publisher. Currently, it looks like the title of the book will be The Honest Economy: How Truth and Transparency will Change Everything. That will be the title of my upcoming TED talk, as well. Looking ahead, I want to continue to speak to the world through my words on the screen or from the stage, so as to help businesses and individuals reach their greatest potential. Beyond that, I want my wife and children to feel happy, protected, and loved. What advice would you give to bloggers and content creators who are trying to build an online audience? Write about stuff your competition won’t write about. Don’t be afraid to push thought in your industry. Embrace teaching in a way that doesn’t have the goal of making you seem intelligent, but rather strive to help everyone you come in contact with have an “a-ha” moment where their inner light bulb comes on. I saw his story in the NY Times. Excellent, excellent case study. Glad you liked it Hashim 🙂 Best to you. I can’t agree more Content marketing is becoming more important day by day to every business. An excellent insight to content marketing. Yep, it’s growing everyday and won’t stop anytime soon Jose, thanks for stopping by and continued success! Thanks Beth! I just recently broke out and started my own local marketing service in Oregon. Content is my biggest theme for the service because it is exactly what built my other ventures online… Most of this was due to people like you and others here on CopyBlogger who actually offer real and useful “content” that can be used effectively. So thank you again Beth and please share some more of your thoughts about local marketing here as often as you can…would love to read it! Glad you liked the story David. Good luck with your new company, that’s great and there’s such a big need! 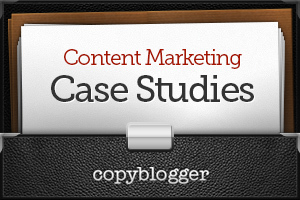 Great case study to prove that Content Marketing can work wonders. Thanks for sharing, Beth! A really inspiring case study. Good point about just answering customers question as a way of generating content. The hardest part typically is coming up with ideas to talk about but by letting your customers handle that part, you also will be contributing pieces that will be of more interest to them as well. I love this post. It’s filled with great bits of advice and wisdom. It’s good to se how brick and mortar business owners can use content marketing to promote their businesses. I especially like the last piece of advice to “be gutsy.” I’m also a teacher and understand how/why being a teacher lends itself to creating content. It’s interesting that Marcus says he doesn’t use social media much for the pool business – but it is more important to Sales Lion. I think that goes to show that certain types social media will work with some products and industries (or audiences) – while it can just end up being a waste of time for others. Really interested in hearing that TedX Talk and in the upcoming book. Sounds good. What an inspiring article. “They Ask, You Answer” is such a simple philosophy that sums up everything you really need to know about content marketing. “My wife can go to the grocery store and buy whatever she wants. That may sound silly, but knowing this is very, very satisfying.” It doesn’t sound silly at all to anyone who’s ever done their grocery shopping with a calculator in their hand and it reminds us why most of do what we do – we want to provide for our families. Really interesting case study. I’m telling clients who are searching for blog ideas to go back and think of the questions they’re being asked all the time. Glad to see that strategy has worked so well. If people are asking in person, chances are they’re searching online for it as well. Thanks for your efforts you put to create this case study. But I have a question. You said you don’t use social media for pool bussiness? Why any perticular reason for that? great case study..so content marketing beats the recession? wow that’s great.